Byron T. asks: Why do bananas go bad faster in the refrigerator than at room temperature? In fact, such banana selling companies as Chiquita and Dole recommend you do this to make the banana last longer in its perfect ripeness stage. Once a banana reaches its optimal ripeness for your tastes, but not before, stick it in the refrigerator to drastically slow the conversion of starch into sugars, almost to the point of stopping the ripening process. The peel will quickly begin to look like the banana’s rotted, due to the polyphenyl oxidase enzyme in bananas polymerizing phenols in the peel into polyphenols. But other than the somewhat unappetizing blackened peel that results from this, it won’t negatively affect the banana in the short term. Remove the blackened peel and throw it away and you’ll see that the flesh inside is as delicious as ever. Bananas can typically be kept this way in the refrigerator for about a week. This is obviously significantly longer than an optimally ripe banana will last at room temperature, which always seems to me to be approximately 6 seconds. If you don’t like cold bananas, simply let the blackened looking refrigerated banana sit at room temperature for 30 minutes to an hour or so and then remove the peel and eat it. If you find the look of refrigerated bananas too unappealing, there are other ways to keep bananas fresh longer. For instance, you can slow the ripening process of a banana by keeping the banana away from other fruits, including the bananas on the same hand the finger came from. Bananas put off large amounts of the hormone ethylene, relative to many other fruits. This triggers and quickens the ripening process significantly. In fact, if you’d like to speed up the ripening of some green bananas or other fruit or vegetables, put them in a paper bag together over night. The trapped ethylene will quickly ripen the fruit, and the paper bag will still let enough oxygen in to keep the ripening process going smoothly. On the same token, putting fresh bananas in the same container as an overripe banana will rapidly accelerate the ripening process of the fresh bananas, which is already quite a fast process. Another banana ripening/timing tip is rather than buying bananas all from the same hand, which usually means all the fingers will be about the same ripeness, pick bananas from different hands of varying ripeness, some that are ready to eat now down to ones that won’t be ready for at least a few days or more. Now keep the bananas stored separately. This way you won’t have the annoying problem of having a hand of bananas that all ripen on the same day, resulting in you inevitably having to throw some of them out. 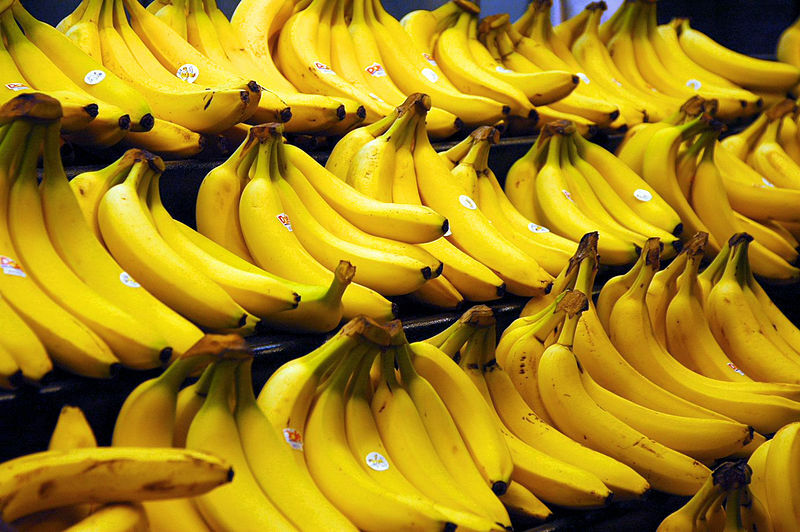 Ethylene is used by banana distributors to partially ripen the fruit before the final distribution to stores. Bananas are picked when they are quite green and hard. They are shipped this way to allow them to be in transit for longer periods, as well as reduce the chances of bruising. Once they are at the local distribution warehouses, they are often exposed to ethylene gas in a closed chamber to drastically accelerate the ripening process, making them ready for store shelves. Commercial ethylene for this setting is generally produced by using liquid ethanol combined with “catalytic generators” to produce ethylene gas. Generally just 500 to 2000 parts per million for 24-48 hours is all that’s needed to get the bananas set for the produce market. Ethylene is also the reason why “one bad apple will spoil the bunch.” The bad apple, or other wounded fruit, will give off quite a large amount of ethylene, relatively speaking, due to the wounding of a fruit stimulating ripening and thus ethylene production. In the enclosed space of a storage box or the like, this will quickly spoil the other apples. The first known use of humans using ethylene to stimulate ripening was the Ancient Egyptians who would slash figs in order to accelerate the ripening process of fruits and vegetables. The Chinese also for millennia have been burning certain types of incense in enclosed spaces to help accelerate the process of ripening pears. Neither of these cultures actually knew why this worked, just that it did. In 1901, Russian scientist Dimitry Neljubow discovered ethylene produced by street lights was responsible for abnormal growth of plants, including stunted growth and thickening of stems. 33 years later it was discovered that ethylene was produced by plants and a year after that that ethylene was integral to the fruit ripening process, among other things. Certain plants can be induced to flower by placing a few banana peels next to the plant in an enclosed space. According to Food Safety Specialist Brian Nummer, the myth that bananas produce toxins when put in the refrigerator started shortly after the famed Chiquita Banana advertising jingle instructing people not to put bananas in the refrigerator. Chiquita’s changed their tune today and correctly recommends simply waiting to put the banana in the refrigerator until it has ripened to your liking. Do Refrigerated Bananas Become Poisonous? I think you mean “root” out typos. As you point out yourself, if you put them in the fridge once they’re ripe, they’ll keep long enough to give you plenty of time to eat them all. Thanks for the useful info, Daven. I like to peel the bananas that look like they’re going to be wasted, break them into chunks and freeze them for smoothies. Thanks! Awesome article. Well written, and love that it actually has references at the end! It’s sad that’s not more common. “…remove the peel and eat it” [par. 5]. I don’t know anyone who might want to eat banana peel. Yes, your editing needs improvement. Otherwise, interesting and useful information. I use a 2nd refrigerator in the basement to keep bananas from going rotten as long as I can. A family member buys way too many too often and this helps keep them fresh longer. I actually had to set the refrigerator temperature to between a regular refrigerator and freezing. There’s frost on my bananas in the refrigerator section. But they still turn dark brown inside eventually. I eat them anyway.I think I will just start peeling, cutting and freezing. It’s 1-step up from this article for long-term storage. This site is so useful. Thanks Daven!! Does anyone have a good way to make the outside banana peel turn black quickly, but keep the inside good? I want to use it for an object lesson.